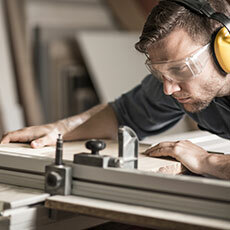 The Scottish Vocational Qualification (SVQ) in Carpentry and Joinery (Construction) at SCQF level 5 allows candidates to demonstrate competence in job-related skills in their area of work and expertise. This qualification covers areas such as general workplace health, safety and welfare, productive work practices and installing first and second fixings or shopfitting or building timber structures. Candidates should be in a job or placement where they are carrying out relevant tasks and responsibilities which allow them to gather the required evidence. The SVQ Carpentry and Joinery (Construction) at SCQF level 5 consists of 4 to 7 mandatory units and between 1 and 3 optional units. This SVQ is a mandatory component in the Level 5 Construction Specialist Modern Apprenticeship. This qualification is now in its lapsing period and will finish on 30.06.2019. Centres should ensure candidates complete the qualification and results are submitted to SQA before 30.06.2019.